The Codex Alimentarius Commission (CAC) is the Joint Food Standards Program of the Food and Agriculture Organization (FAO) and World Health Organization (WHO) charged with the mandate of developing food and feed international codex standards for safeguarding the health of consumers and ensuring fair trade practices in food. The word Codex is an acronym referring to Food Law that governs the development of food standards at international level. The international standards set by the Codex are referenced (recognized) by the World Trade Organization (WTO). The CAC is an intergovernmental organization that has its headquarter in Rome, Italy. CAC has six regional coordinating committees with the FAO/ WHO Africa Region Codex Coordinating Committee (CCAFRICA) as one of them. Kenya became a member of Codex Alimentarius Commission[CACA] in 1969 and was housed by Public Health, MOPH. Kenya, Cote d’lvoire, Senegal, Cameroon and Nigeria joined CAC at the same time Other Africa countries which became members of CAC before Kenya are Uganda and Burundi in 1964,Madagascar, Ghana and Senegal-1966. In 1983 Kenya coordinated CCAFRICA held in Nairobi city. In 1985,Kenya coordinated the second meeting of CCAFRICA in Nairobi.During these time KNCCP was responsible for promoting coordination of Codex food standards work undertaken by CAC within the region by Kenya. 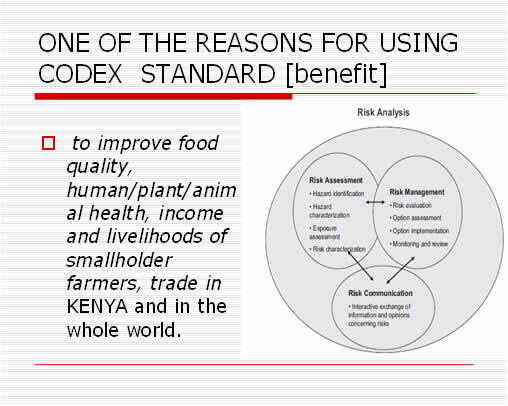 Kenya make reference when harmonizing national food standards with the international codex standards. EAC- partner states take into consideration codex standards where there is trade dispute. while harmonizing EAC standards for trade and consumer health protection, Codex standards are made reference to where there is no consensus. Currently Kenya has adopted over 200 Codex standards to facilitate trade and to protect the health of consumers. Very few private sectors commitment to international meetings. Inadequate sensitization of codex activities in private sectors. Only attend company relevant codex meeting but not horizontal/general codex meetings. Defer most meetings to mother companies leaving regional representatives out. KEBS has adopted over 200 Codex standards for enforcement. Kenya participation in Codex technical food standard development has increased from 3%-80% since 2004. Private sectors have been great supportive in facilitation of Codex food standard development. Kenya will be hosting the CCAFRICA-23rd international Codex food standard development in Nairobi for its final term to discuss the above mentioned documents for one week 2nd- 6th September 2019. The National Codex Committee is entrusted with the task of corresponding to Codex Alimentrius Commission which is affliated to the food and Agriculture Organization "FAO" and World Health Organization "WHO" . This committee comprises of representatives from. Along with experienced and production quality and consumer protection associations. National codex committee is affliated to Codex Alimentarius Commission. The Codex Alimentarius or "Food Code" was established by FAO and the World Health Organization in 1963 to develop harmonised international food standards, which protect consumer health and promote fair practices in food trade. It is about safe, good food for everyone - everywhere. International food trade has existed for thousands of years but until not too long ago food was mainly produced, sold and consumed locally. Over the last century the amount of food traded internationally has grown exponentially, and a quantity and variety of food never before possible travels the globe today. The CODEX ALIMENTARIUS international food standards, guidelines and codes of practice contribute to the safety, quality and fairness of this international food trade. Consumers can trust the safety and quality of the food products they buy and importers can trust that the food they ordered will be in accordance with their specifications.